Great fun for your little one to carry around. They can keep their money, library cards and coins safe. 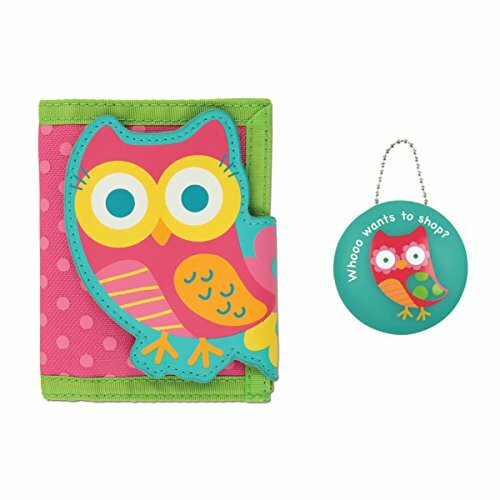 The cute Owl wallet is a great place for kiddos to stash their cash and coins. Made of durable nylon with convenient velcro closure. Multiple inner pockets including one with a zipper for coins. Adorable Owl coin holder with fun saying! Coin holder is durable and pliable with a metal ball chain for easy attachment. Just squeeze to open the slit and place change securely in the back. It is approximately 2.5" round. Wallet measures 10.5" x 4.5" (Opened) and 3" x 4.5" (Closed). Available at Daisy May's Boutique with other cute gifts for kids.